Investing in training and the correct tools will result in a more accurate diagnosis, faster repairs, reduced waste and higher profits. 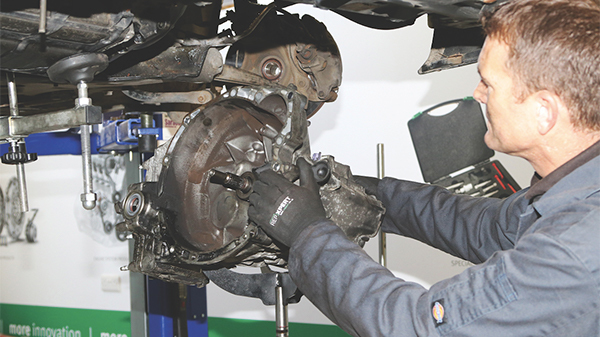 While clutches and flywheels were adopted very early in the motorcar’s development, Rob Marshall asks Schaeffler why so much misunderstanding exists in many of today’s modern repair businesses. Other efforts involved slipping leather belts, using designs inspired by factories of the Industrial Revolution, but their limited effectiveness and questionable longevity saw their rapid demise. It was not long before friction clutches were employed, notably in Karl Benz’s Motorwagen of 1885. Yet, over 130 years of development has seen the clutch tolerate not only considerable increases in engine torque and efficiency but also higher customer expectations. Just taking a 1950s classic car for a brief drive would reveal clutch pedal pressures that would be unacceptable to today’s average motorist. Especially in high-performance cars of those times, the clutch pressure plate contained several stiff coil springs, to provide sufficient clamping force to negate unintended friction plate ‘slip’. While increasing travel offers a partial solution to a heavy pedal, the real breakthroughs came with the inventions of both the diaphragm spring pressure plate in the 1960s and, more recently, the self-adjusting pressure plate, both of which were pioneered by Schaeffler, via its LuK brand, which supplies both car manufacturers and aftermarket repairers with clutches and flywheels. 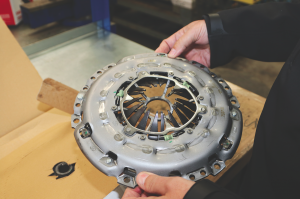 While the diaphragm-spring design has become universal for passenger car applications, Malcolm Short, Schaeffler UK’s Technical Services Manager, reports that the Self-Adjusting Clutch (SAC) ensures not only a consistent clamp load and biting point throughout the life of the clutch kit but it also guarantees that increasingly higher clutch pedal pressures are not required, as the clutch wears. For the uninformed technician, faced with replacing a clutch within a set book time, the SAC mechanism within the pressure plate can de-adjust during fitment if not installed correctly. Schaeffler recommends that you don’t attempt to reset it, either. While you can measure and check that the pressure plate diaphragm springs’ length remain the same from box and when fitted to the car, it would be too late, if you found a difference in length, indicating that the adjuster had been activated. The solution is to use a SAC fitting tool, which is bolted to the flywheel with the clutch fitted loosely. The tool applies pressure evenly to the centre of the pressure plate, so that its retaining bolts can be tightened. When used in conjunction with a friction plate centralisation tool, you can be sure that the clutch is fitted correctly before refitting the gearbox, reducing the risk of a potential warranty claim tying up a technician and a workshop ramp for another full day. Unfortunately, additional parts might need to be replaced that become obvious only once the customer has authorised the repair and the gearbox has been removed. Aside from driveshaft oil seals (which tend to be fairly inexpensive, easy to identify and straightforward to renew) a bent clutch fork, worn pivots, a deteriorated release bearing sleeve and weeping crankshaft and gearbox input shaft oil seals should be renewed but they add to the final invoice total and it’s worth preparing the owner for extra outlay. These components are not included within a typical clutch kit. Yet, to save the carmaker cost, concentric slave cylinders (known otherwise as the concentric release bearings/ centrally actuated release mechanisms) combine the hydraulic slave cylinder, release arm, clutch fork and related components within a single compact part, which should be replaced at every clutch change. To help technicians, Schaeffler, with its LuK brand, supplies replacement concentric slave cylinders with the clutch kit in either its RepSet Pro range, or the RepSet DMF range, in cases where a flywheel is needed as well. 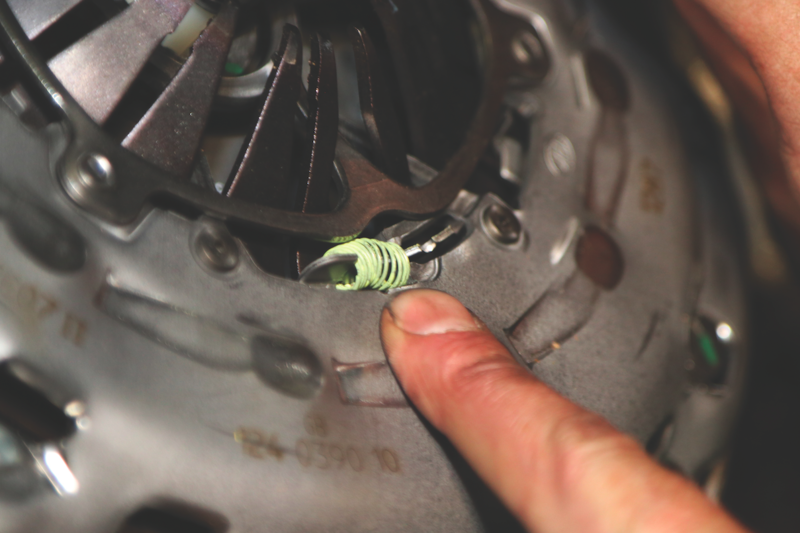 Similarly, Alistair notes that, during his training tours at independent workshops throughout the UK, many technicians believe that a self-adjusting release bearing with a centre hub that can be manipulated by hand is faulty. “They are designed to be like this,” he emphasises. He also warns technicians to support the gearbox adequately throughout the procedure and never permit its weight to hang on the input shaft. 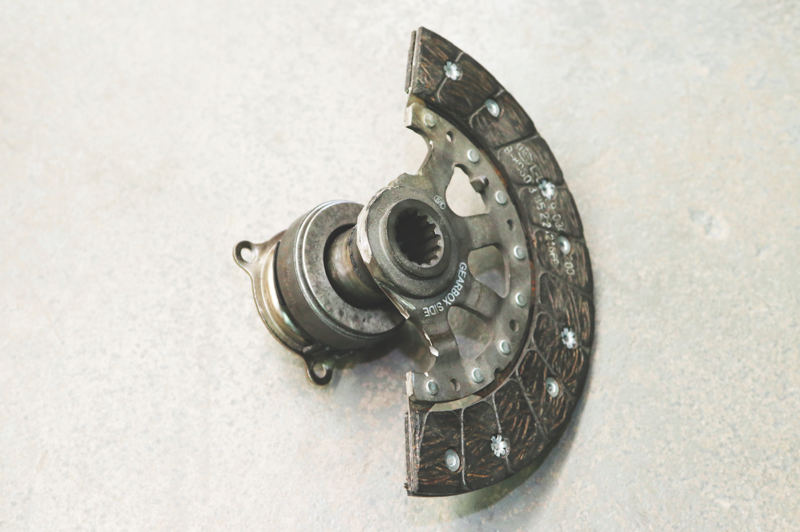 While it is thought commonly that this action bends the input shaft, Alistair reports that the clutch friction plate is designed to be sacrificial – so it becomes damaged, instead of the transmission. Again, expect a warranty claim to be rejected, if either supplier, or manufacturer, sees evidence of clutch plate distortion that is typical of it bearing the transmission weight. Alistair recommends that all of the gearbox’s dowels are intact and that it is supported from beneath, prior to the bellhousing bolts being refitted. Unfortunately, a number of motorists (and even technicians) believe there is a special place reserved in hell for the creator of the Dual Mass Flywheel (DMF). Common real-world accusations include that it is unfit for purpose and an unnecessary extra expense to replace. Yet, if you speak to a typical motor manufacturer’s engineer, praise is heaped on the high-tech flywheel, for permitting them to develop low capacity and lightweight engines that develop impressive torque figures at low RPMs, while protecting the transmission and even the passengers from exposure to excessive torsional vibrations and shock loadings. Developed and patented by Schaeffler (LuK), the Self Adjusting Clutch addresses the weightier pedal and varying bite point, as the friction plate wears and causes the geometry of the release mechanism to alter. The self-adjusting mechanism is incorporated within the pressure plate, in which the original diaphragm spring angle is maintained by an internal adjuster ring. This fully extended spring shows that the adjusting mechanism has compensated to its maximum extent for a worn friction lining. The fully compressed spring on this LuK SAC pressure plate shows that the internal mechanism has not yet de-adjusted. An SAC fitting tool compresses the pressure plate fingers and preloads the clutch evenly. This prevents the clutch pressure plate from distortion, which is likely to cause the self-adjusting mechanism to de-adjust. 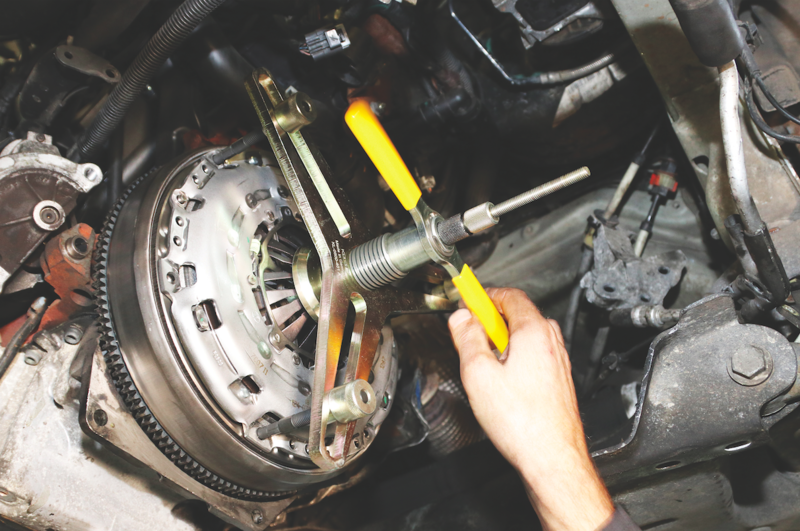 It is still possible to make elementary errors when installing a clutch kit. The technician had installed this friction plate the wrong way round, which resulted in it welding itself to the release bearing nose. Understandably, the DMF has come a long way, since LuK pioneered the first production installation for BMW’s high torque, but low revving, 525e (‘eta’) ecological car in 1984. While space precludes us from debating single mass flywheel conversion kits within this feature, Malcolm Short confirmed that a recent exercise, in which Schaeffler invited technicians to drive two identical cars, one possessing its standard-fit DMF and the other converted using a single mass flywheel kit, saw any initial scepticism concerning the DMF’s relevance evaporate rapidly, just by the differences in the driving experience alone. Even so, Alistair Mason reports that a lack of understanding about how it works can result in many serviceable DMFs being replaced unnecessarily. 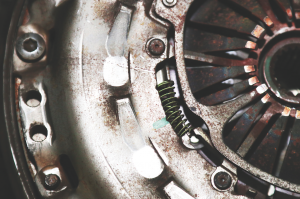 When maintained and driven correctly, Schaeffler expects a LuK DMF to last two clutch changes. However, unless obviously damaged, or overheated, assessing DMF condition is difficult by sight alone. Rotational wear rates, in the internal arc springs and centre bearing/bush, or rock, must be measured with a special tool (LuK part number 400 0080 10). Every DMF possesses its own unique tolerances and Schaeffler ensures the technician can have swift access to this information, by dialling-in the DMF part number on its Checkpoint DMF app for mobile devices, which can be downloaded via Google Play. You can see this tool being used in a workshop application in the Clutch/DMF tips video HERE. Some DMFs, especially those fitted to cars with Stop-Start technologies, are fitted with a friction control plate to restrict arc spring movement and some technicians confuse a working plate with internal wear, when using the DMF diagnostic tool. 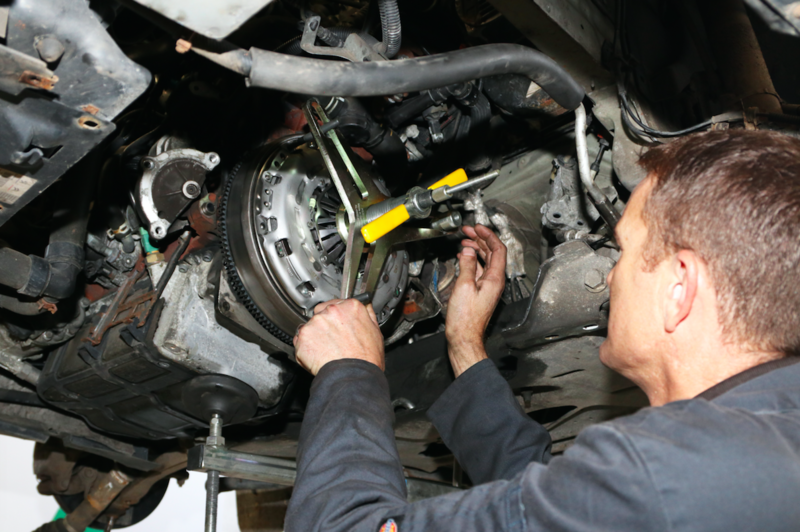 This is when taking advantage of Schaeffler’s clutch training and online services will help. Alistair Mason adds: “Our team of technical experts carry out clutch training in a multitude of formats at technical evenings and trade fairs around the country and we offer more formal training courses at the REPXPERT Academy in Hereford. All clutch training includes DMF design, diagnostics and testing. Our on- site training is focused currently on double clutch systems, for which we offer a unique repair solution that concentrates more on gearbox operation and clutch replacement, rather than the DMF. While it is well established that a poor driving technique will shorten clutch life dramatically, such as excessive slipping at high engine revolutions, or resting a foot on the clutch pedal when cruising, DMF longevity is influenced similarly by the driver. As smoothness is a key advanced driving technique with proven safety advantages, the car’s mechanical parts benefit as well. Erratic driving makes the DMF responsible for smoothing- out extra torsional vibrations, caused by abrupt, heavy and erratic applications of throttle, as examples. Similarly, the DMF masks, to a degree, the ‘kangarooing’ affect of labouring the engine in an inappropriately high gear. Allowing the engine to idle for very long periods of time, with the air conditioning activated, is also not conducive to long DMF life. Engine tuning and towing excessive weights can place both clutch and flywheel outside their intended design limits. The DMF also masks certain engine running faults. While an engine misfire, for example, can have multiple causes, it creates extra vibrations that the flywheel covers-up, at the expense of its durability. Therefore, should you suspect that a DMF has failed prematurely, seek out the reasons why – such as failing injectors (or leaking seals), or even engine compression that varies significantly between cylinders. If a DMF exhibits wear beyond its operating limits, the first sign might be a slight clutch judder, or a minor rattle that becomes most noticeable when idling, or when the engine is switched- off. Be wary of blaming noise from other failing components on the DMF, such as a delaminating crankshaft pulley rubber balancer, or a deteriorated air conditioning clutch. Ignoring DMF noises for long periods is inadvisable. Not only will the noise worsen but also, in rare cases, metal particles could be attracted into the starter motor, hastening its demise, prior to the DMF disintegrating and damaging the bellhousing case. While the humble clutch and flywheel have been in existence almost for as long as the motorcar itself, the technology has matured significantly. 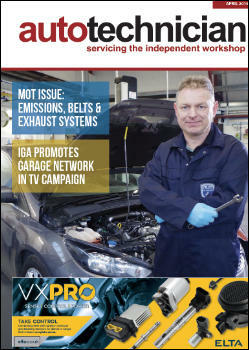 As they are wear items, automotive technicians need to keep abreast of the latest developments and why have they been necessary, to ensure an effective, long- lasting repair and minimal warranty comebacks. Thanks To: Schaeffler (UK) Ltd.